Like her portraits of angels, displayed elsewhere in the exhibition, this work by Takaya Miou was strongly inspired by the Symbolist movement in late 19th-century Europe. 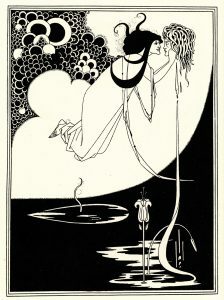 In particular, it references a folio of drawings that Aubrey Beardsley (1871–1898) produced in 1894 to illustrate the one-act stage play Salomé by Oscar Wilde (1854–1900). in 1896, while Wilde was in prison. This work by Takaya is closely related to The Climax, the 15th image in Beardley’s Salomé folio, especially in its emphasis of flowers, hair, and dripping blood as primary compositional elements. Although Beardsley envisions the young dancer as vicious, staring menacingly into the eyes of her victim’s severed head, Takaya depicts her as far more sympathetic. 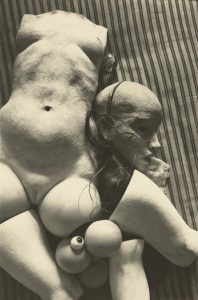 She embraces the male figure (presumably John the Baptist), and her mechanized body, reminiscent of the surrealist dolls of German sculptor Hans Bellmer (1902–1975), seems to be as badly wounded as his, as if they were lovers trapped in a mutually destructive relationship.